Well the coverage, so far, of this momentous event has been over at SchlenkerDoodle's Blog [1,2] but, I figured that I would add my POV. 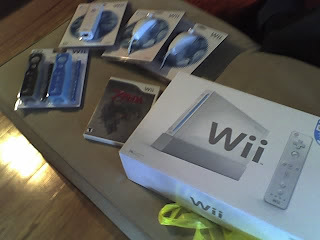 Late last Saturday night I became one of "those guys" who is willing to camp out for a video game system. E and I were over at Team Chambers' until about 1:30 and since we were close to Target and I knew that they were supposed to receive a shipment, I figured that we could swing by on the way home. There was absolutely no activity, we found out later that other Targets had received some but not Athens. The big blue box was just up the road so we stopped by there too. I counted 9 brave souls. On the way home I made up my mind to drop of E and turn around and come back. I had planned to wake up at 6 or 7 and head straight there but, I didn't want to miss this shipment and have to wait another month. I dressed warmly and made a pot of coffee. I put 1/2 of it in a travel cup and the other 1/2 in a thermos. I grabbed a lawn chair and off I went. I sat down at 2:30am as number 11 in line. There wasn't much activity inline until sunrise: people trying to sleep, the Racetrac guy offering us free coffee, iPods, books, etc. It was cold but, not unbearable. After sunrise we got more chatty we compared stories and kept each other company. The first guy in line was there before the store closed the night before and had been told that there would be 30 available. The first BB employee got there about 6 am (a full 5 hours before the store opens) he was very professional and told us that he would confirm the number and let us know as soon as he could. He posted within the hour that the number was indeed 30 and gave us details on how they would be distributed. 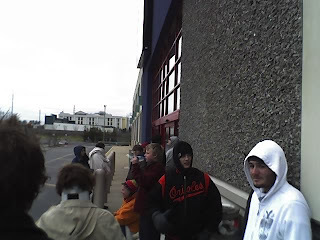 The 30th person got in line at about 9:00. 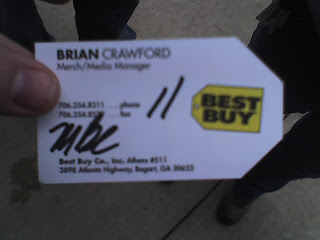 At about 10:45 the BB manager handed out numbers to the first 30 people in line. When the store opened at 11:00 they marched us into the employee breakroom and called us 2 at a time to run through the "buffet" of games and accessories and to the registers. By the way that people were grabbing things guy number 30 probably had some slim pickings. H and A came over and we each created a Mii and played for a couple hours but, after having stayed up all night, I fell asleep, literally, in the middle of playing Zelda. In the days since I have played a good bit. I consider it well worth the wait and effort. My family is coming up this weekend to play. Thanks to Mom for the Christmas present and E for being my SAG Wagon with breakfast in the morning. P.S. If we know each other in meatspace and you have a Wii send me your "Wii Number".